Fox News Channel, which is about to enter its 22nd year, has plenty to celebrate these days. Ratings remain high, for one. The network is also close to launching Fox Nation, an ad-free digital streaming service that will feature exclusive content from personalities such as Sean Hannity, Laura Ingraham, Tucker Carlson, and Tomi Lahren. 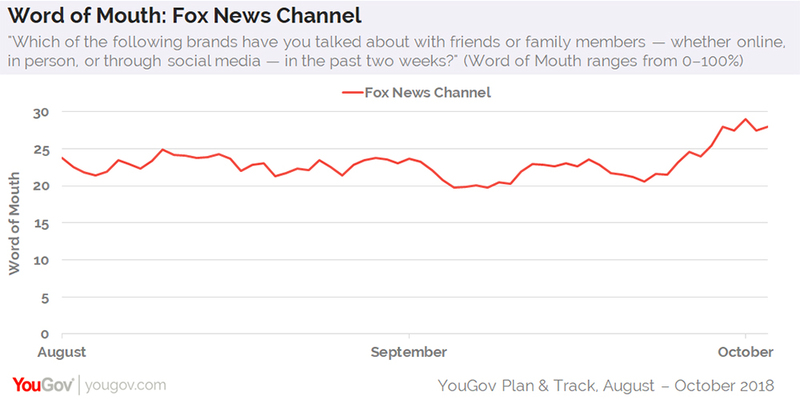 Now, new data from YouGov Plan & Track can add another item to the list: Earlier this week, Fox News Channel’s Word of Mouth score — which asks US consumers aged 18+ if they’ve discussed a particular brand with friends or family members in the past two weeks — hit a high for 2018. On October 1, 29% of American adults recalled talking about the network, up from 22% a week prior. 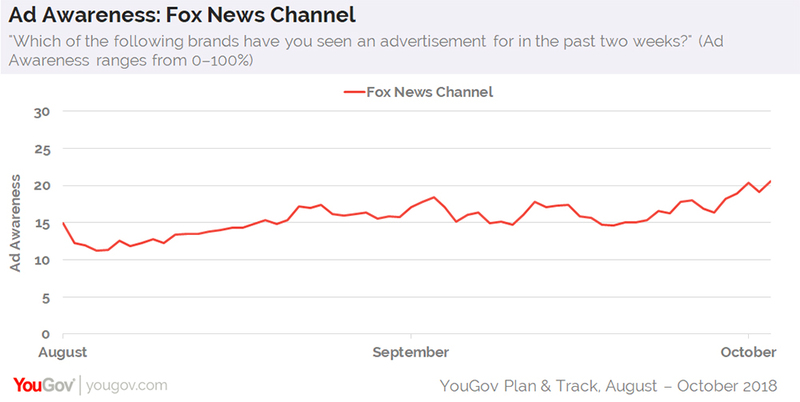 So far, Fox News Channel’s average Word of Mouth score for the current calendar year is also 22%. On Monday, September 24, Fox News ran an exclusive interview with embattled Supreme Court Justice nominee Brett Kavanaugh. The program was highly watched, and likely contributed to the network’s boost in Word of Mouth. As Fox prepares to launch its subscriptions-based Fox Nation later this fall, the brand’s Ad Awareness metric is also reaching heights unseen in 2018. Yesterday, October 3, one in five (21%) US consumers aged 18+ reported seeing an advertisement for Fox News Channel in the past two weeks. In early August, for comparison, only 11% of people said the same. The network’s average Ad Awareness level for 2018 thus far is 15%.